This project began as a very simple idea. Elffriede, a visual artists collective from Vienna, invited 34 musicians, from all over the world, to compose 34 two minutes long pieces as soundtracks for pictures that were specifically drawn for this event and were then collected in a colorful but minimal book, built around a strong interaction between text and images and with a naïf graphical style. The result is quite enjoyable and inspired. Even with this deliberate fragmentation and the wide stylistic range of the sounds, spanning from soundscapes and field recordings to electro-acoustic and audio-digital explorations, all the threads seem to come together in a sound which is the sum of the parts, with little differences, thanks probably to the final touch of Martin Siewert, who painstakingly cut and mastered everything, reducing beats, clicks and cuts, acoustic and electronic instruments and songs with skills and care which have many things in common with the art of drawing, where the brush strokes may look flamboyant, but were always 'well thought out and sedimented' before." 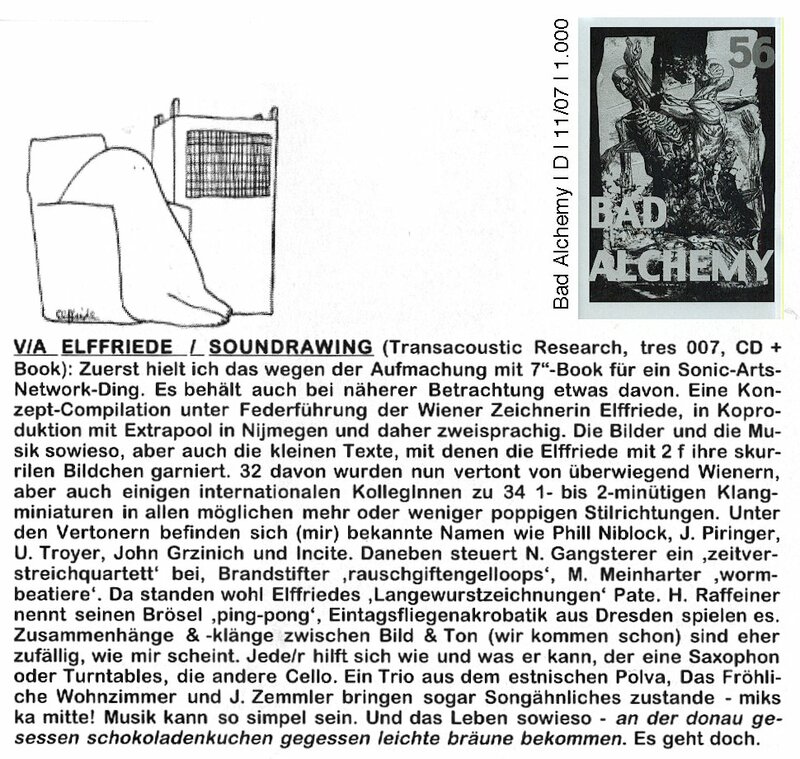 "I’ve just reviewed a couple of releases of this Austrian label, but I can truly say I love it, one was their “hearing” compilation and the other was a vocal based electronic release assembled by that Jörg Piringer featured here among the sound artists appearing on this sampler, last and most important this label put out the Vegetable Orchestra which itself deserve endless respect. While usually I’m quite skeptic concerning samplers I was so well impressed by the first collection put out by these dudes, I was quite curious and yes, my expectations haven’t been deluded at all since this work is damn good. 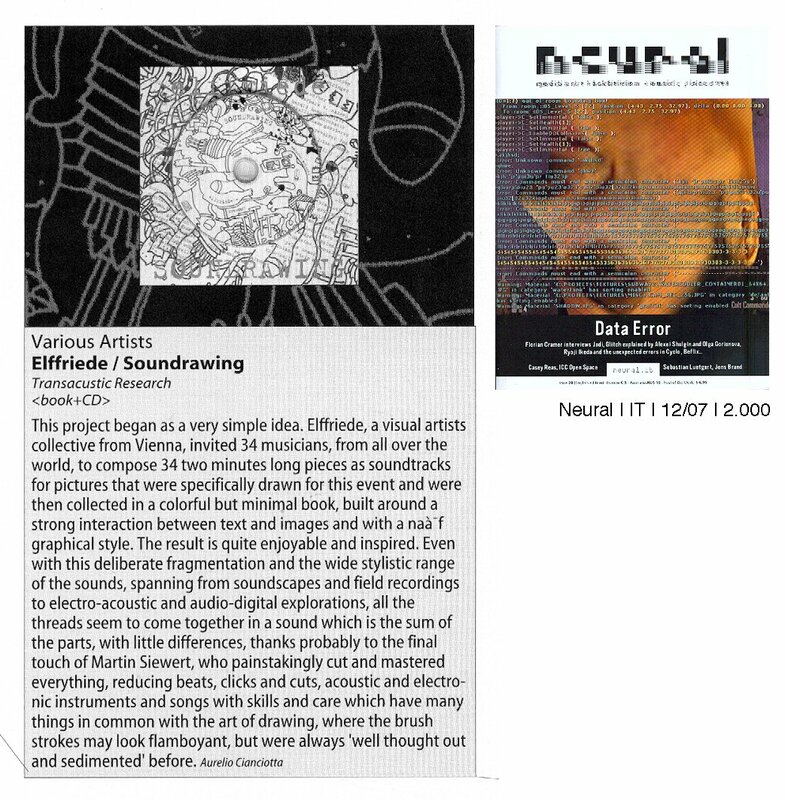 This collection features a good number of electronic musicians to which the visual artist Elffriede asked expressly to compose music inspired by her funny childish, comics-alike drawings. Taken for granted the process of interpretation is quite subjective and also the fact that the Elffriede’s works are quite weird the compilation is homogeneous in a damn good way. The surprise is that this cd coming out in a 7” shaped packaging is filled of musicians I dunno except for Piringer, Murmer and Phil Niblock (sorry if I forget some other “big” name) but the ninety percent of the sketches/tracks are high quality material. The fact is that the abstract, nocturnal electronics feel is a constant thread joining the most of the songs plus the majority of the songs deal with what can be filed as “sound art”. The last thing clearly explains why you have such an over-abundance of unconventional frequencies, field/electro-acoustic recordings well married with electronics and just a small dose of conventional or rhythmical tracks. 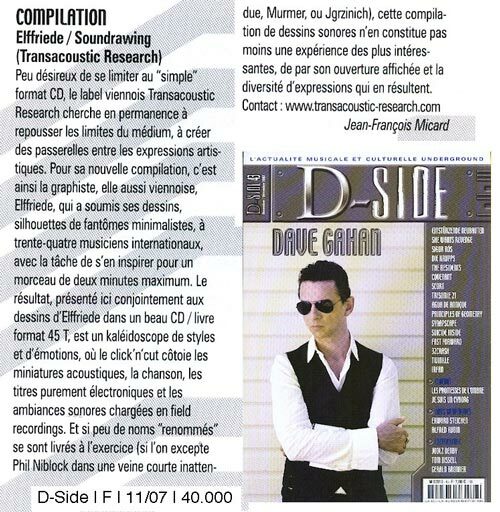 As I pointed out at the beginning of the review, this’ a quite homogeneous compilation be it for the inspiration coming for the drawing or for the fact we live in massified alternative and experimental scene…well…I can’t say why, but what really matters as in the majority of sampler is that the whole cd offers both an interesting and pleasant listening. 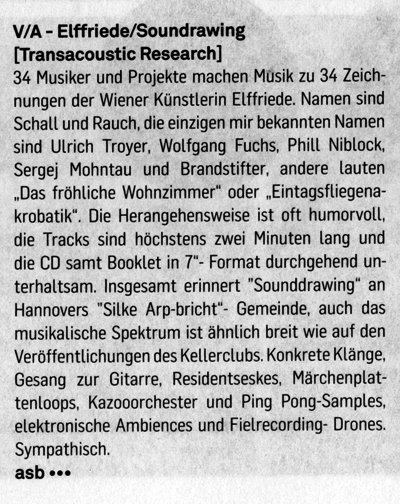 Sorry for being so boring but again Transacoustic Research gives sense to the adjective “experimental” and considering the incredible amount of cheap garbage passed as “research” or “experimental music” these days it gets five points more." Extrait de l'album Soundrawing du dessinateur elffriede. Nichts weniger als die gegenseitige Durchdringung ansonsten separierter Kunstgattungen gelingt der in Wien wohnhaften Zeichnerin Elffriede.